Ah, summer. The sound of waves crashing as you relax at your favorite vacation spot. Late-afternoon breezes chasing away the heat of the day. Beads of condensation forming on the glass of perfectly chilled, crisp white wine as you lift it to your lips, ready to let the cares of the day drift away. Whether you go for that crisp white, a sweet rose or a fruit-laced red, temperature matters when it comes to wine. If you have aspirations of becoming a wine scholar or just want to show your wine- sophisticate friends that you know your stuff, too, it helps to know a little bit about the proper temperature at which to store and serve wine. The wine refrigerator is the appliance that will get you there. Wine refrigerators, also known as wine chillers or wine coolers, have become standard features of high-end kitchen renovations. Unlike regular refrigerators, which store food and drinks below 40 degrees, wine refrigerators are designed to maintain temperatures ideal for wine, whether it is being stored, aged or served. They offer protection from wine’s biggest enemies: heat, lack of humidity, temperature variation, vibrations, ultraviolet light and odors. In short, wine refrigerators are your best option for storing wine this side of a royal palace cellar. If you think you are ready to up your wine storage and serving game, there are a number of factors to consider. While wine refrigerators aren’t any more difficult to operate than a regular refrigerator, the details of wine storage matter, especially if you’re storing wine for the long haul. I spoke with Marshall Tilden III, vice president of sales at Wine Enthusiast, which sells an array of wine refrigerator models and publishes the popular Wine Enthusiast magazine, for some guidance on what wine drinkers need to think about before they make the jump from wine rack to wine refrigerator. As with many appliances, you should start with size. Look at how much space you have available, particularly if you opt for a built-in wine refrigerator. Many built-in models mimic the size of other major kitchen appliances, like dishwashers or refrigerators. But, if you don’t have room for or don’t want a built-in model, there are many portable models available, with a range of capacities. When making your choice, consider how many bottles you currently store, and think bigger. Wine is a hobby that tends to grow like the boldness of the flavor in a perfectly aged cabernet. “We always stress to customers to get a unit that can hold about 25-50 percent more than your current collection,” Tilden says. Once you get into the world of collecting wine, it grows quickly. 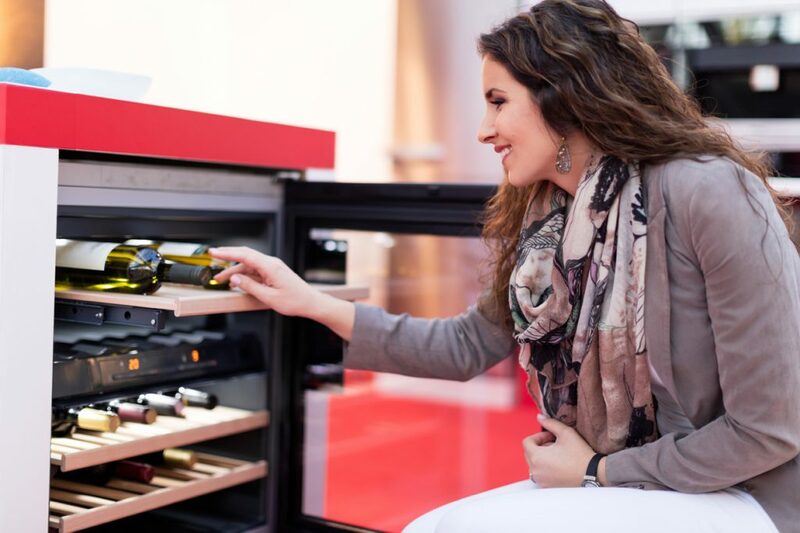 It’s best to buy bigger than you need, unless you’re constrained by space.” Fortunately, you have options ranging from small units that store a few bottles to models that can hold hundreds of bottles. Wine refrigerators are available in finishes consistent with popular appliance looks, like stainless and black stainless, and are often integrated into the kitchen near refrigerators. Single-zone wine refrigerators generally keep wine at 55 degrees, which is ideal for storing and aging, Tilden says. However, if you are storing, aging and serving, consider a dual-zone model, which allows you to keep zones of the wine refrigerator at different temperatures. That way, you can move a bottle into another zone when you’re getting ready to serve it. Where you keep your wine refrigerator can also affect the temperature inside, so make sure the one you choose can handle the ambient temperature. This is especially important if you are keeping the refrigerator someplace warmer, like in a garage. Humidity also affects wine, and higher-end units may include humidity controls, Tilden says. This is important for longer-term aging. “If the cork dries out, air gets in, and the wine oxidizes,” Circulating fans help move the air and moisture, and some include spaces for lava stones to absorb moisture. Aging wines are sensitive to motion, and certain models also include features that minimize vibration. Wine can be an investment, and it’s a good idea to think about security as well. “The majority of units that hold over 36 bottles or so come with locks,” Tilden says. Ready to relax? I hope you thought ahead—in the time it took to read this article, you could have brought a glass of red up to the perfect serving temperature. Time to pour yourself a glass.